When you are starting a business, you have so many responsibilities that it’s easy to feel torn apart. Financing, marketing, customer communication, business operation, and other tasks are hard to manage without assistance. Most startups don’t have the resources to hire separate teams of specialists for every one of the above tasks. That’s when the marketing automation tools come into play. You can substantially simplify the marketing part of your startup by using these little helpers. This all-in-one tool is one of the most popular solutions in for automated marketing. It helps you set up a list of tasks required to bring in a larger target audience. It’s easy to use due to the intuitive interface so it’s suitable for a marketing specialist without any experience. HubSpot has been on the market for a long time. It managed to develop an impressive customer support. It has useful analytics and reporting features. Hubspot can also help with building landing pages without IT support requirement. The tool works for a business of any size from micro startups to large enterprises. It has a downside in the price department. The price tag is quite heavy. Automate your Email Campaigns with SalesHandy! Next up on the list is SalesHandy, as the name suggests this tool comes in handy when you need to improve your email marketing campaign, online data analysis, and sales communications. It’s suitable for small and mid-size businesses, however, large companies can find a few useful features as well. With SalesHandy, you can track the activities of your email recipients in regards to the message. You can share a document with your client and edit it in real time. The program helps you create centralized email templates, making it easy for the team to speed up the emailing process. You can take advantage of a free version or get a more complex set of tools for an extra cost. Mautic is known as a small business marketing automation tool in the market. It offers open source marketing automation, which is attractive to the startups with a tight budget. The tool is packed with useful features at no cost. This automation software is fully customizable. You can make unlimited integrations. Support variable A/B testing on websites and your landing pages. The software can be integrated with other open source options, including WordPress. While the tool doesn’t have extensive customer support, it has a big community of users. The user community is enhancing and introducing new features on a regular basis. The downside of this software is its learning curve. You’ll need a professional for setting it up and hosting. This tool allows you to automatically send SMS, email, and push notifications depending on the clients’ behavior. The software monitors the users’ behavior and triggers a response based on their actions. Another name for what this program does is “trigger-based messaging”. You can send an email with a time-sensitive discount offers to the users that come to your webpage without buying any product. The program sends SMS to the clients, who are having trouble with the payment page, creates personalized emails for new users, and more. The program has a simple interface. Making a rule for creating notifications is fast and easy. This moderately priced marketing automation tool allows you to automate your email marketing process. The software has a drag and drops canvas to help simplify the work. You can make text-based messages by using available templates or uploading custom HTML. You can use this service to nurture leads by setting up an efficient email marketing campaign. The tool offers dynamic text, A/B test messages, in-app messages, and SMS. As a bonus, autopilot provides extensive reports and Zapier integration. NudgeSpot is one of the top marketing automation platforms that allows you to send messages to your clients based on their behavior. It’s a great tool for any customer communication. Starting from the welcoming messages, when the user joins the site, and ending with personalized offers, NudgeSpot does a satisfactory automation job. This software considers the geographical location of your customers and checks for regular user behavior. It also allows you to proceed with real-time communications, satisfying the customers’ need as soon as they require your attention. NudgeSpot works with email, push notifications, and SMS. The tool comes with a reasonable price tag suitable for startups with a tight budget. This marketing automation tool is an all-in-one solution for follow-up marketing. This platform is user-friendly and moderately priced. The service is designed for small businesses. It can help you with email and social media marketing. Active Campaign sorts out the contacts and finds new information about the potential and existing clients. The service tracks the user behavior on the website to help you create an adequate response. Meanwhile, it creates a database for more personalized marketing. The tool allows you to change the content of your email based on the contact lists and how they are tagged. Active Campaign has a user-friendly API, which allows you to integrate it with other programs. This powerful scheduling tool helps startups save time on scheduling appointments. It can also boost sales and improve the quality of service. It creates a link for the person you want to schedule an appointment with and allows him or her to pick the time. This tool eliminates lengthy emails and lets you keep the event on your calendar. The solution is simple, elegant, and efficient. It doesn’t just make scheduling virtually automatic, it makes sure both sides remember to keep the appointment. If you need to interact on social media to improve your marketing campaign, HootSuite can be a great solution. It allows you to manage all your social media platforms within one program. You can use it to post updates, connect with contacts, and review responses. 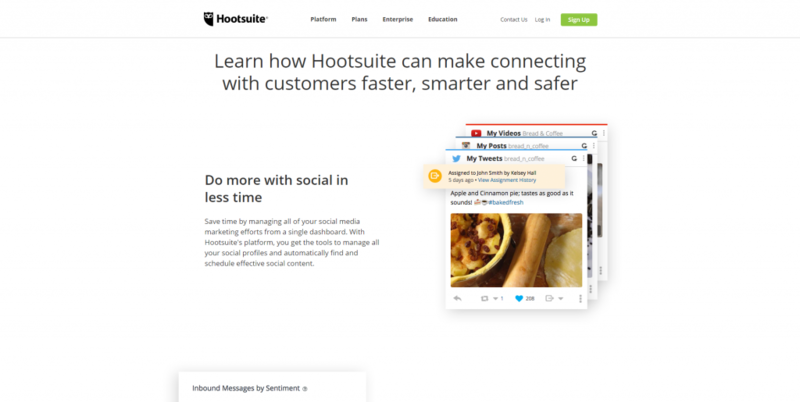 You can also use HootSuite to gather information on people mentioning your brand, make updates to multiple networks, and create social analytics reports. The price tag is moderate if you choose HootSuite for personal use. This service provides marketing automation solutions for mobile marketing. You receive a mobile marketing cloud to send personalized information to targeted clients based on where they are traveling. The program also provides context optimization, personalization solutions. The software analyzes customer’s identity, activity, location, purchase history, and movement patterns to optimize the marketing strategy. Each one of the above marketing automation tools can simplify your marketing process by automating the procedure. Startups that have to deal with a strict budget might want to consider Mautic as a moderately priced all-in-one solution. Other programs help you target certain areas of your marketing campaign. Specialized tools usually do a better job in their niche than all-in-one solutions. In addition to marketing automation tools, be sure to check out these SEO tools to help with your search engine marketing efforts. There are a lot of other automation tools for Startups in the market but these 10 are our pick when it comes to Marketing automation. If you believe that there is a related tool that should be on this list, then please do share its name with us in the comment. If you believe that there is a related tool that should be on this list, then please do share its name with us in the comment.